BP's oil spill disaster isn't even the half of it. Bill Gates; the CEO of General Electric Jeffrey Immelt, and various other senior-level corporate-types have issued a plea to the US government to triple spending on energy research to $16bn/year. Not only does the group (named the American Energy Innovation Council) want to see greenhouse gas emissions cut by 80 per cent by 2050, they also want a national energy board set up to ensure green issues are at the forefront of the nation's mind. 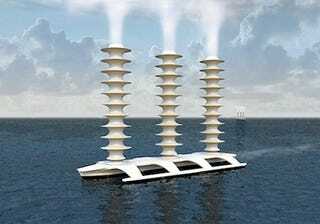 Having Bill Gates on the team should also see more adventurous, risky solutions being proffered—such as the artificial clouds he has invested $300,000 into (pictured).